We recently had the opportunity to meet with U.S. Congressman Ted Lieu of California. Specifically to present thoughts on and strategy for combating the lack of civility and inclusion happening all across America. 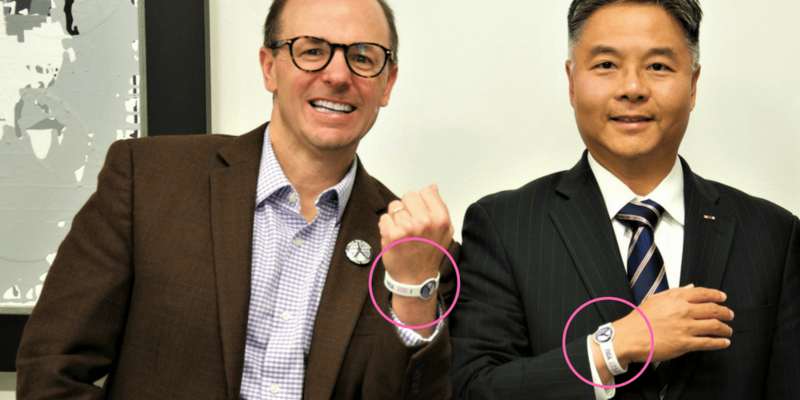 The picture above shows this Democratic leader wearing one of our movement’s unique reminder bands – plus our two smiles. A great way to leave the meeting! We’ve been so pleased at the positive response growing across the country, as businesses, organizations, and individuals are ‘banding’ and bonding for a purpose bigger than themselves. Today, polarization and disrespect of others’ views and opinions has become a major challenge to our societal fabric. It’s grown to nosebleed levels within our homes, work cultures, schools, media, and online communication platforms. By ‘views’, I don’t mean just politics or social issues. Today, people are often shamed, blamed and treated on any subject or topic where there are strong differences of opinion. Examples include how to invest money, religion, project management, sales strategy, what movie to see, and where to spend the next family vacation. Surprisingly, the meeting with the Congressman had little to do with politics. The focus placed more broadly on society’s runaway train of incivility. A highly-fueled locomotive carrying a cargo of rudeness, insults, name-calling, condescension, and a ‘go lower’ behavior. Many people of all ages, genders, races, orientation, political views and diverse backgrounds have increasingly taken on actions and behaviors meant to rebuff and exclude those with different views – rather than to listen, learn, challenge, grow and respect others for their differences. To be clear, our movement is called Walk The Ridge. It’s motto is I SEE YOU, I HEAR YOU, I RESPECT you. Notice there is no I AGREE WITH YOU. Because being civil and inclusive doesn’t necessarily mean that people have to give up or compromise on their views – so long as they are not illegal or hate-based. However, we strongly believe that people need to learn, develop, practice and improve habits of civility and inclusion – while finding opportunities to share their new soft skill with others. Our site has free guides, statistics, and of course…our bands! Many people purchase, wear and share these unique bands – meant to act as wearable ‘anchors’ to remind and improve on personal accountability for behavior. It also becomes a teachable moment and gift, when noticed by others. Perpetual and Consistent Growth. Whether fueled by feels of anger, hostility, lack of control, or retribution – incivility and excluding others (by view or opinion) is growing. In a 2016 study, Christopher Rosen, an organizational scientist at the University of Arkansas, noted that individuals who experienced a perceived insult earlier in the day would later strike back at co-workers. A reaction the researchers linked to lowered levels of self-control. The Workplace Impact is Costly on Many Levels. Many studies and statistics link incivility (behavior and actions less severe, but more common than harassment or discrimination) to loss of productivity, quality of work, increased absenteeism, greater costs, and decreased engagement. Uncivil Behavior and Actions are carried like a virus. I spoke to the Congressman about the blurring between the workplace and home life. Especially noted in a study noting how incivility at work can bleed into marriages and treatment of spouses. 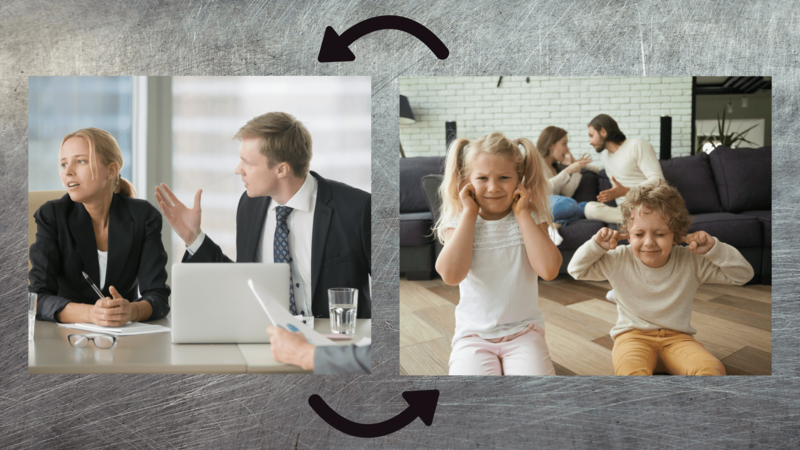 It also works in reverse, as incivility at home or through an online engagement can lead to negative behavior brought into work. Incivility spreads like a toxic venom – fueled by a positive feedback loop of stress, lack of impulse control, environment, and consistently polarizing media messaging. This is why mere workplace policy, buzzwords in leader addresses, and motivational wall posters often fall short in sustaining both personal and group change. In most people, civility is not a light switch. You don’t just ‘set it and forget it’ – even if policy tells you to do so. Behavior change starts with adding civility and inclusion as facets of your company core values. Then in your learning and development (L&D) and training programs. Finally, weaving in different functional business areas, as well as employee life cycle and culture. Recently, I had the opportunity to meet first with the CHRO for a public company. This led to a presentation to the organizations’ executive leadership team. I presented facts and figures on my research of the company and its cultural shortcomings. Many heads nodded in agreement and one of these leaders actually put a band on his own wrist. He appeared oblivious to the fact that the breath of the culture was less than stellar – though reported as such from popular, public-facing websites. Some of the company core values, co-developed between the CHRO and the CEO included integrity and teamwork. Yet from time time, he had a reputation to fly off the handle with emotional outbursts and demands. Our organization would be analyzing and then delivering a customized series of tactics and connected key metrics to create positives for hiring, employee engagement, and even seeking to catalyze specific functional areas through improved civility and inclusion. After all, if teamwork is a core value, then shaming, blaming, and a willingness to be open on listening and sharing ideas is key. Situations like these often frustrate human resource professionals, who see the importance that limitations in culture and engagement bring to performance and getting the full measures of devotion to company mission. We see our unique mission to move civility beyond a buzzword. Like any skill, to know that its growth and improvement help define us as individuals. The beauty is that with communication and engagement being so prevalent digitally and physically in the world of business, there is an excellent change for companies to step up and be a shining difference for their employees and communities. This week I just started a video series of tips and value-adds on civility and inclusion. Working on improvements. In closing, Congressman Lieu came away with a better understanding about the challenge of today’s incivility and its connection to diversity and inclusion. As our society continues to grow within our uniqueness in cultures, backgrounds and views, we have an opportunity for positive change. One where we can grow to become less impulsive and combative in our opinions, while becoming more open to learning and growth from others. I hope you’ll visit the website, look at injecting greater civility into your workplace diversity and inclusion measures, look to brand to civility as an empowering community share, and feel inspired to BE the change our society needs so very badly.